Some classic hardball from a famous maker of ammunition that knows a thing or two about providing value, reliability and functionality in their product. 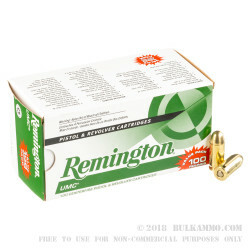 Remington UMC has been doing this for shooters of the 1911 (and later other models) for many decades, and this round is a descendent of a heritage for excellence that this brand and this round were partially made famous for. 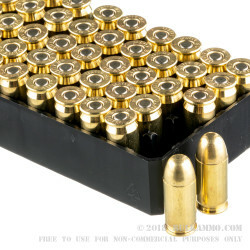 This is a bulk pack that offers 6, 100 round mini cases of 45 auto ammunition, for a total of 600 rounds. 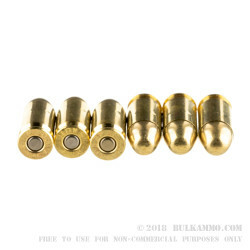 The round itself is a very standard, well known hardball 230 grain projectile loaded in a brass case with a Boxer primer and a good quality powder. This load is a standard range ammo, with a muted recoil and a relatively mundane set of performance numbers – enough o function firearms reliably, but not on the upper end of the performance spectrum. Many old time 1911 shooters however, swear by this round as a self defense load due to its reliability and heavy projectile. Expect 825 feet per second velocity and about 350 ft. lbs. 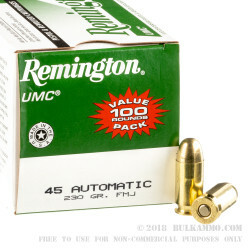 of energy out of the barrel, making this a great round for shooting and function training for those who prefer to shoot the bargain ammunition with no feeding concerns.